Effetre Apple Blush is a medium ochre opaque, and apart from a little shockiness in the rod, it's pretty nice to use. Its consistency is buttery and easy to manipulate, and it is also stiff enough that its nice to sculpt with. This colour is pretty streaky, so it is not great for applications where you want a smooth, uniform colour. The more you strike Apple Blush, the more orange it gets. 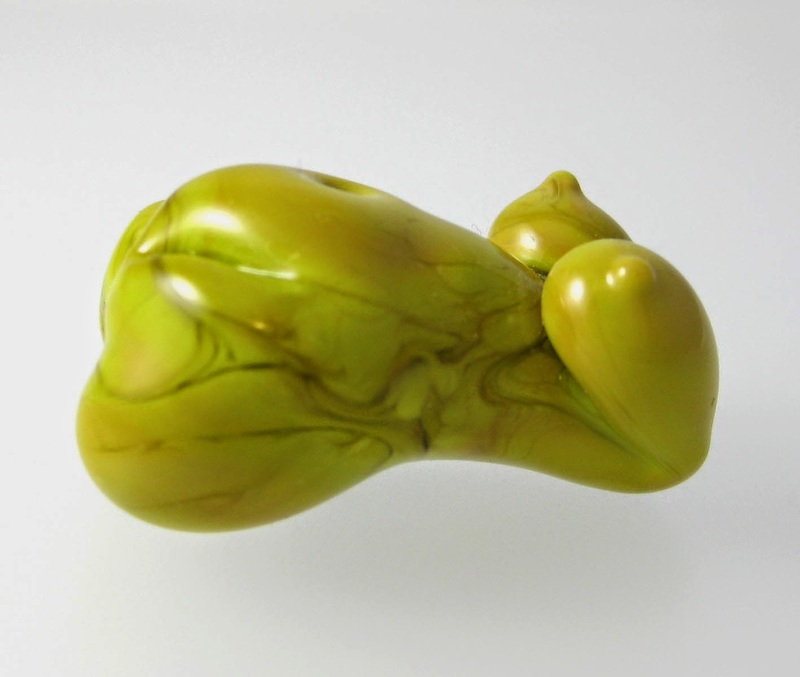 This colour is pretty strange, because it starts out a greenish yellow, and then as you work it, it loses its greenish cast and develops a mottled orange blush. 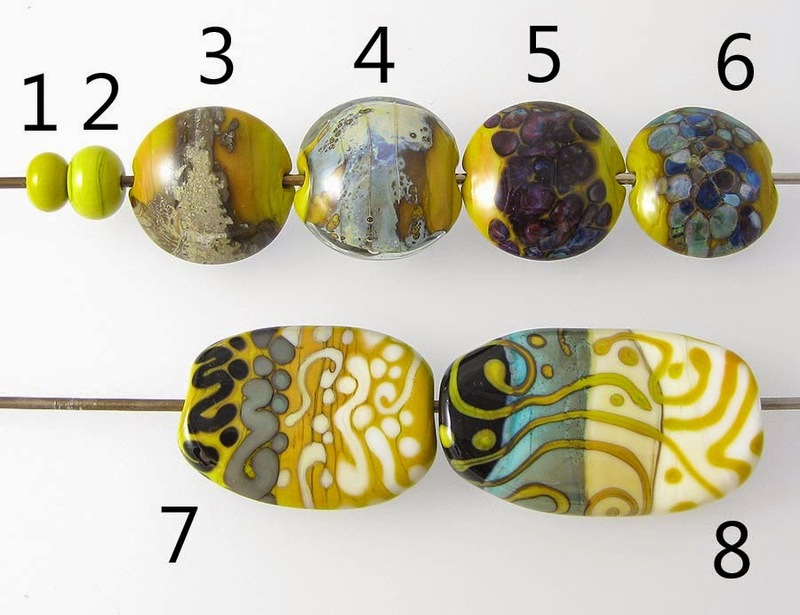 You can see throughout the rest of these test beads that there is a lot of colour variation in these beads, depending on how they've been worked. I wish I could figure out how to keep this colour the sort of electric chartreuse colour that it is when you don't strike it at all. 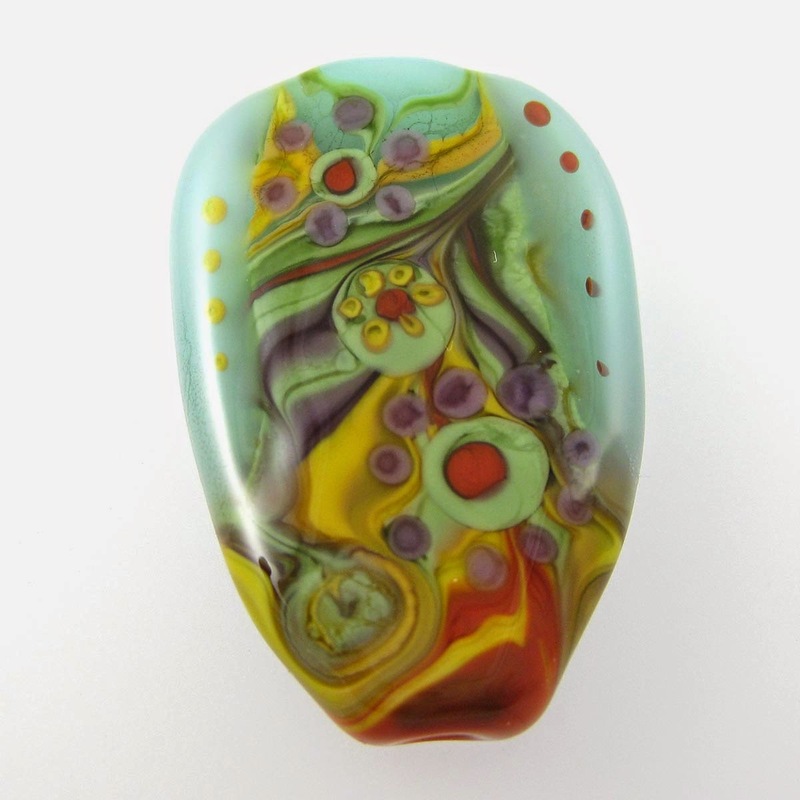 I have made a few spacers that colour and really liked it, but it seems impossible to keep that colour on a larger piece. Here you can see that the orange blush is most pronounced right around the silver. I don't really know the reason for this, but am going to guess that silver accelerates whatever this glass does when it strikes. Silver gets a brownish haze around it on top of Apple Blush, and coalesces into a crust on the surface of the bead. When the silver is reduced and encased, it looks blueish and shiny. 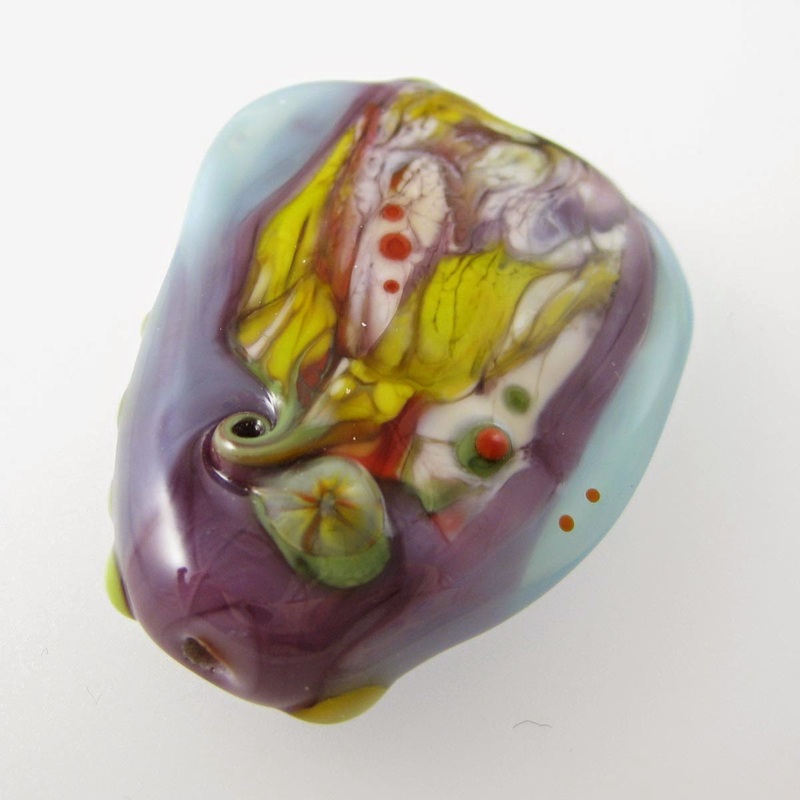 I got pretty nice colour from my striking silver glass frit on top of Apple Blush, which would be wonderful if the colour of Apple Blush was a better match for the pinks, purples, and blues that it evoked. 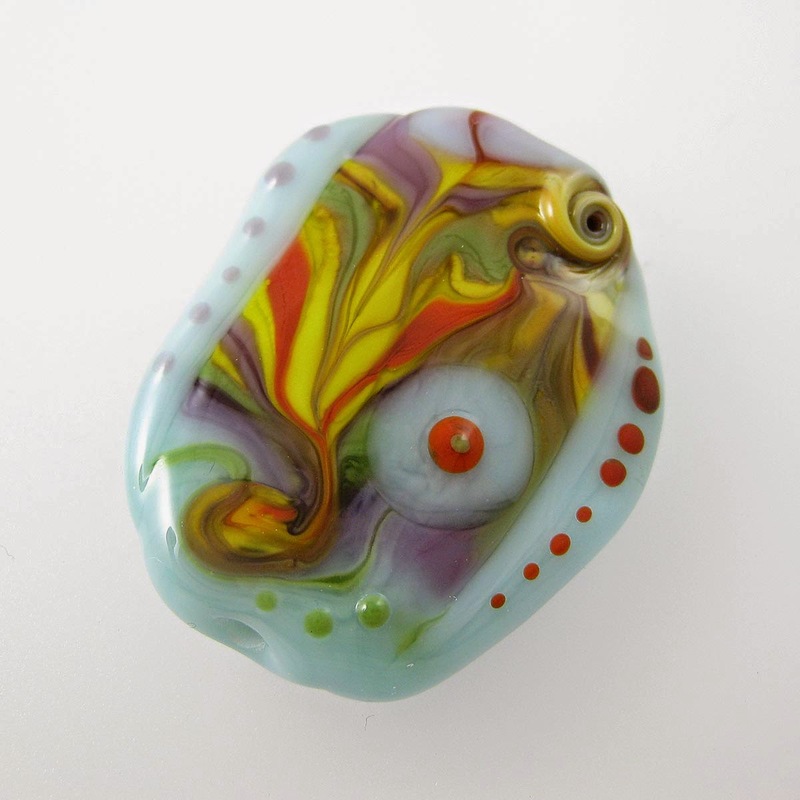 In the bead on the right, the reducing silver glass does its thing as well but the colour combination is really off-putting. On top of Tuxedo, Apple Blush separates and develops a faint, crackly, translucent line in the middle of stringer lines and its dots have a mottled appearance. 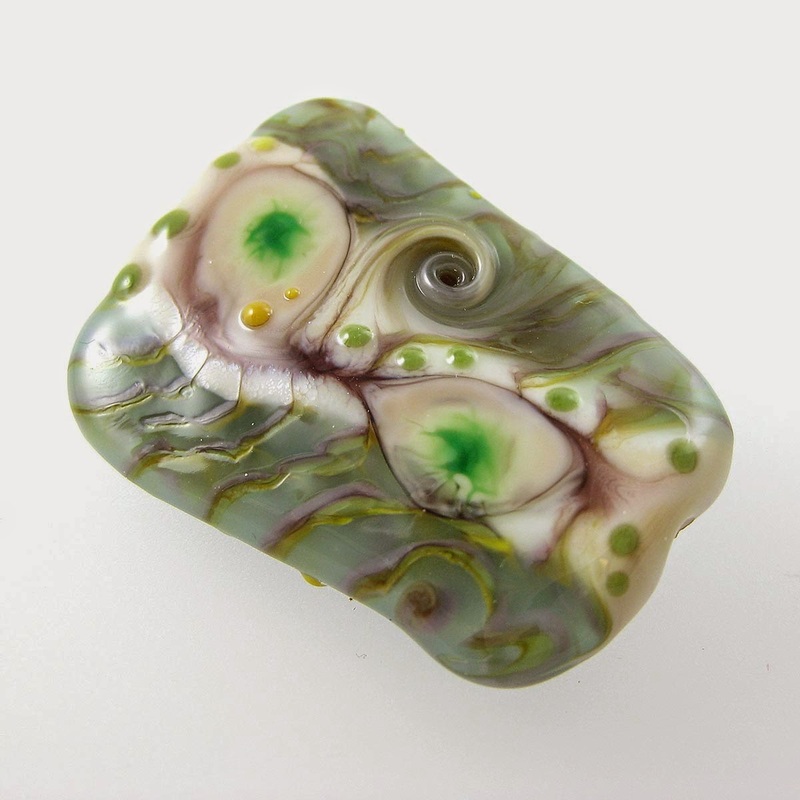 Apple Blush develops a dark line reaction with Copper Green, and Copper Green spreads out on top of it when its used in stringer dots and lines. Like Ivory, Apple Blush also forms a dark line reaction with Opal Yellow. Where I used Apple Blush over Opal Yellow, he dark line is an orangey yellow, and the Apple Blush interior has a greenish cast. This is a pretty interesting reaction, and it increases the amount of colour contrast between these two colours considerably when they are used together. 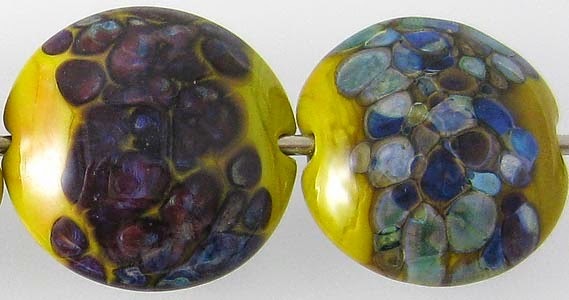 Opal Yellow on top of Apple Blush is much less interesting, although you can see in the bead on the left that the Apple Blush looks sort of angry and crackly under the Opal Yellow, which has a faint brownish line around it. Ivory spreads and separates when it is used on top of Apple Blush. 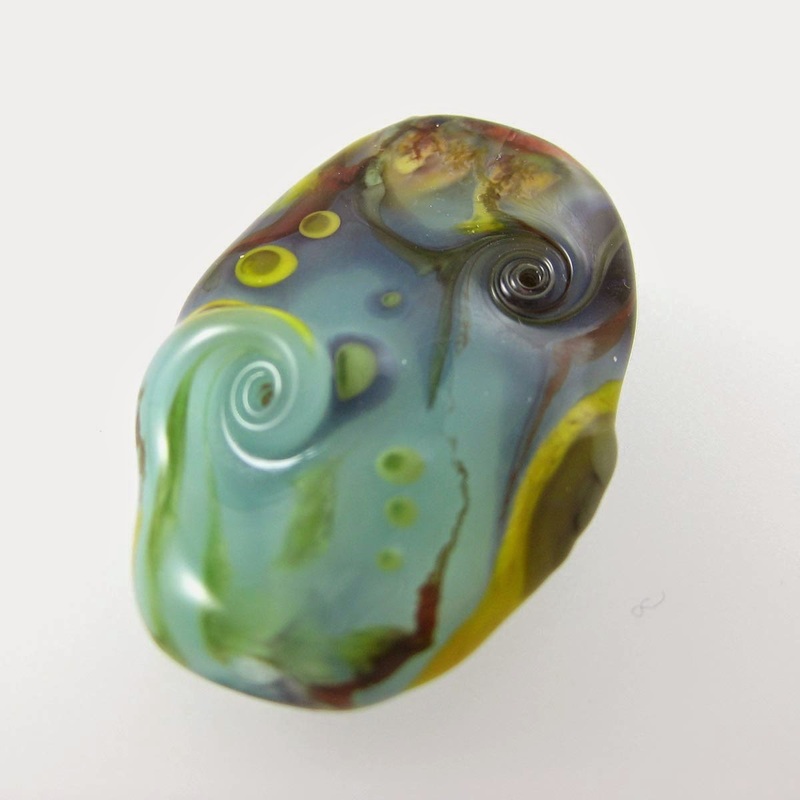 Here is an Apple Blush goddess bead, which shows the magnitude of colour variation, streakiness, and general weirdness that you can expect from this glass.